In a distant galaxy, a small human task force is trying to find a new home for humanity. The problem? In Planetary Dustoff, almost everything is hostile and you’re just one person, forging forward against obscene odds. Planetary Dustoff, from Rymdfall, sees players become the pioneer of Humanity’s future: a fighter with a knack hand, challenged to destroy idols, clear enemy encampments and prep areas for future landfall. 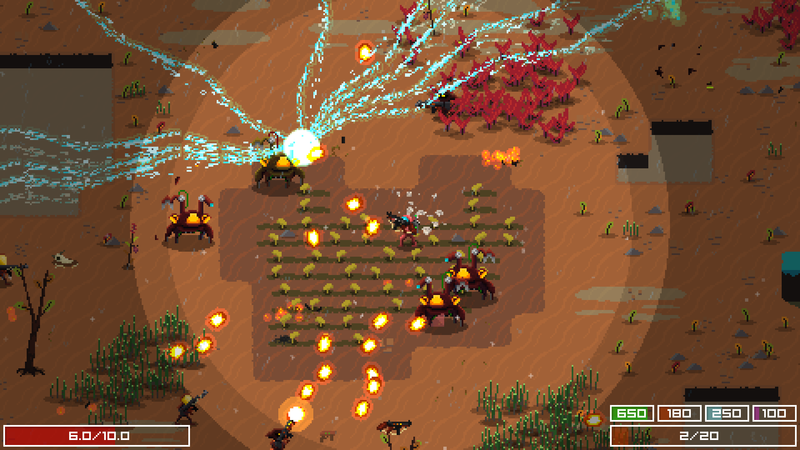 It’s a twin-stick shooter filled with cool weapons, masses of enemies and plenty of explosions. We were lucky enough to play through some of Planetary Dustoff while at this year’s Nordic Game Conference. While the build (and the game) were quite far from the final, release build, it felt responsible and refined — even if I am terrible at shooters. Rymdfall describe the game as a ‘moddable top-down roguelite shooter’ with a major focus on their intention to make the game easily moddable for release. It’s already brimming with a variety of enemies, from humongous mid-bosses to teleporting rogues and shotgun-wielding hunters. Weapons are equally diverse; during my few attempts with the game I liberally dipped between the four ammo pools, throwing sparks of chain lighting into hordes of enemies, setting others alight with flamethrowers or simply gunning enemies down with traditional ballistic weapons. There was a massive selection, and I’m really looking forward to seeing more of them in action. It’s not just a celebration of shooting and explosions, however. A lot of effort is going into the visual effects. The most recent update, prior to the team heading to the conference, included overhauls to lighting, as well as making water reflective. Neither is essential to a shooter, but both are fantastic additions and sure signs that the team are being thorough in their development plans. Planetary Dustoff doesn’t currently have a release date, however when it does launch it will do so for PC. If you’re interested in following the development of the game then you can find the developers on Twitter @rymdfall.